Another example of Westcoaster branching out? Well, I'm going to use this site as platform for some of my concert-going experiences. After all, I go to a ton of concerts each year, and every once in a while, I even snap some photos from my fancy camera. Anyway, since 2010, every June, the city of Pasadena has put on the country's largest free independent music festival in the form of Make Music Pasadena. 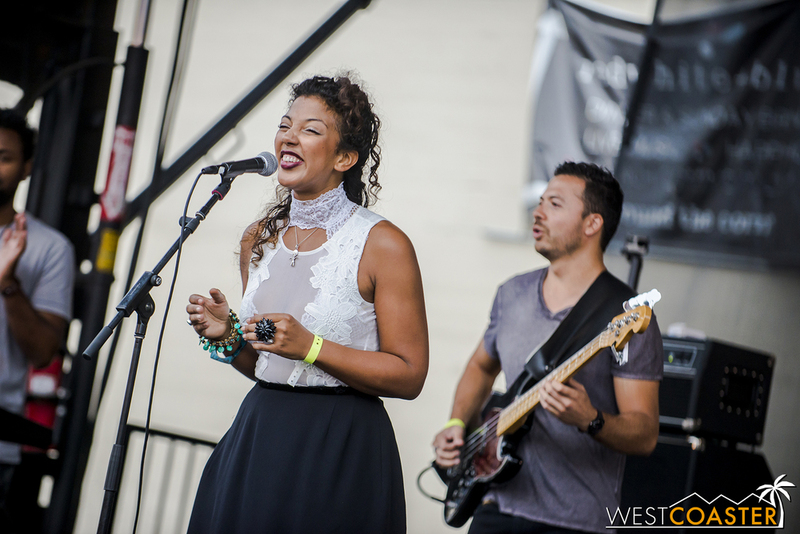 Spread out across multiple sites in Downtown Pasadena, including street stages, alleys, churches, bars, and plazas, this fun event has featured numerous rising indie bands in the past that have gone on to gain fame on the big name festival and touring circuit. This year, as I have the past five years, I made my way over to the home of the Tournament of Roses to check out some great musicians performing their craft. Here are the bands I saw on a dreary and drizzly afternoon! Indie rockers from Southern California, Hunny features an eclectic new wave that has some a bit of indie pop and a bit of chill melody. With wry and sarcastic banter, they had an enjoyable set in front of a smaller-than-usual crowd--most likely due to the rain. Well, "rain"... it was more of a steady mist. Also hailing from Los Angeles, PAPA is a drum and guitar duo that has been on the scene for a few years but hasn't really broken through any mainstream radio play. That's fine with me, since I feel like they're a hidden gem in the local music scene. The first time I saw them was opening up for another band at The Observatory in Santa Ana. Since then, I've tried to see them again, because their energy live is quite addictive. Plus, how often do you see a band where the lead singer is the drummer? It didn't hurt that Darren Weiss was full of sarcasm and dry, silly banter that kept the crowd interested. 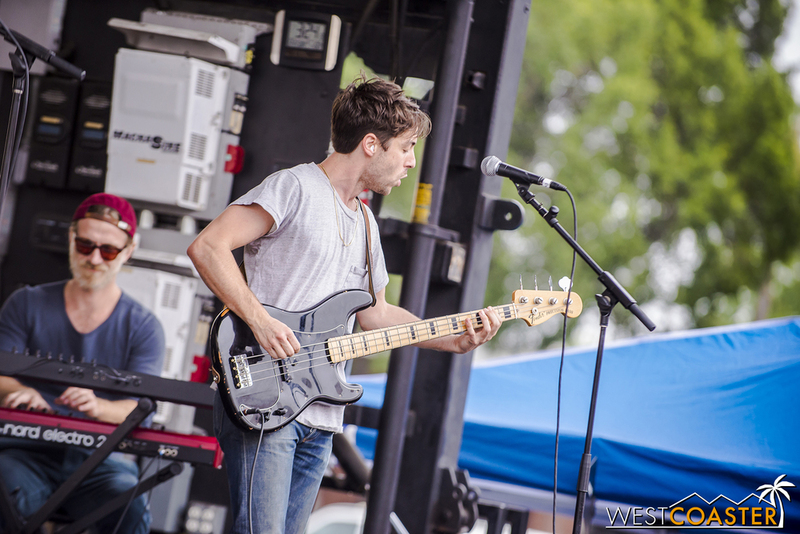 Pop and folk rock band The Mowgli's are pretty much hippies. With a message of love and acceptance, they play a cheery, feel-good style of music that is pretty infectious. Though they weren't the headliners at the Main Stage, it seemed that there were plenty people in the crowd who were eager and ecstatic to see this high member count band. And they delivered with a rousing gig filled with many features from their most recent album, Kids in Love, closing with their hit from their first album, "San Francisco." Hailing from Australia, these guys are probably best known for that song "Trojans" that would just never leave the radio a couple of years ago. Although they started late, they gave the heaviest set of the day (not that they're particularly heavy, but compared to the other bands I saw). They probably should have played longer, but the late start bit into the next artist's time. That's about my only criticism, as they came with an energy and sharpness that I don't recall from previous shows. The live presence definitely showed signs of maturation, and they certainly had the crowd dancing to their every beat! I don't know much about this band, but I caught them at the end of the day as a bonus. Described as "indie tropical," these folks didn't necessarily sound particularly "tropical" to me (but maybe I was expecting calypso music), but they were fun and energetic, with a bit of a relaxed dance party vibe in their music. Lead singer Felicia Soumah had a sincere step in her beat, and their set brought a nice, celebratory close to the Playhouse District Main Stage at Make Music Pasadena.